The Mercedes GLK crossover gets freshened for the 2013 model year. MEADOWS OF DAN, Va. -- Mercedes-Benz will be the first automaker to offer a diesel engine in a small crossover in the United States when the GLK250 BlueTEC goes on sale next spring. 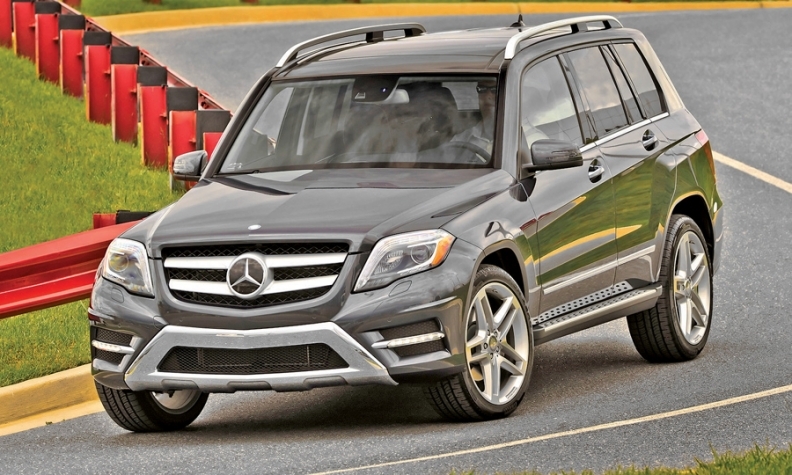 The GLK250 will be powered by a 2.1-liter four-cylinder turbodiesel that generates 190 hp. Mercedes offers diesels in three other SUV or crossover models in the United States. The GLK, which debuted in 2009, gets freshened for the 2013 model year. New engines and a more luxurious interior are the biggest changes, said Todd Grieco, Mercedes-Benz USA product manager for SUVs. The 2013 GLK350 and GLK350 4Matic all-wheel-drive gasoline versions get a 3.5-liter V-6 with direct injection. The engine debuted in the third-generation M class, which went on sale last year. The engine produces 302 hp, 13 percent more than that of the same-sized engine on the outgoing 2012 model, and 273 pounds-feet of torque, a 6 percent boost over the 2012 version. Both 2013 GLK350 models have a standard seven-speed automatic transmission. The price starts at $37,965 for the rear-wheel-drive model. The 4Matic variant is priced at $39,965. Prices include shipping. Mercedes will release pricing for the diesel version closer to launch, Grieco said. The 2013 GLK350 is expected to get 15 percent better fuel economy than the outgoing model because of the new engine and a standard stop-start system. The 2012 GLK gets an EPA-estimated 16 mpg city/22 highway. Mercedes said the company does not have an EPA fuel economy rating for the 2013 GLK. Among exterior changes are new headlights, grille, front bumper and LED running lights. At the rear, the GLK gets redesigned lights with LEDs and a wider bumper. The most dramatic changes are inside, where the GLK gets a more upscale instrument panel with standard burl walnut trim and aluminum air vents from the SLS sports car. The shifter is moved from the center console to the steering wheel. There is also a new display screen for the new-generation mbrace2 information and entertainment system. Mercedes has made electromechanical steering standard on the GLK, as well as Attention Assist, which is designed to warn drowsy drivers and keep them alert. A host of safety features from Mercedes' larger vehicles have been added as options, including blind-spot monitoring, lane keeping and parking assist. GLK sales peaked last year at 24,310 vehicles. In the first five months of 2012, sales of the small crossover are up 7 percent to 10,228 units. With the new model coming in, Mercedes expects GLK sales to rise at least 10 percent for the full year. Grieco said the outgoing GLK had a conquest rate of 62 percent, the highest of all Mercedes vehicles in the United States. He said most GLK buyers are either empty nesters or young families without children.